SAR, the universal designation for Search And Rescue, can appear as a designation on air, land or marine vehicles in many different countries. Always the vehicle and the people who provide the service are treated with respect. 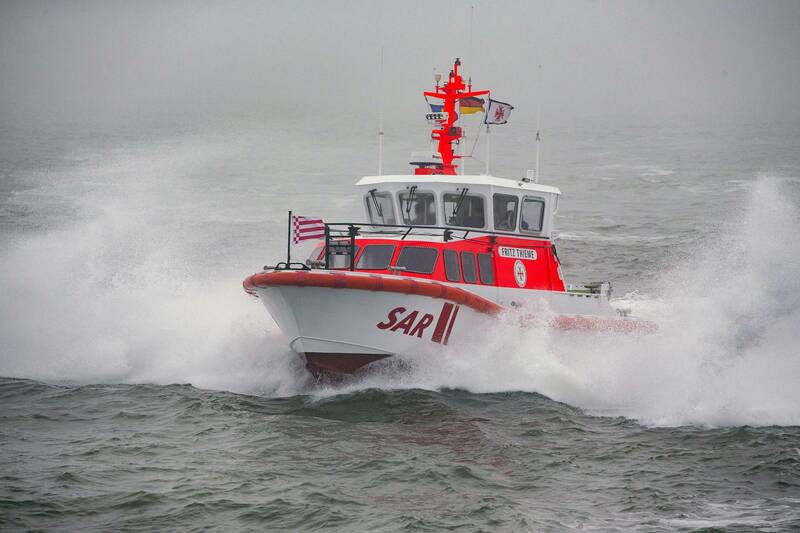 For those who are saved from life threatening situations, SAR takes on an even greater value. A single Cummins QSB6.7-M engine producing 280 kW (380 mhp) at 3,000 rpm turns a single propeller through a ZF286A marine gear. The power will give the boats a 20 knot speed and, for towing coastal vessels out of danger, a 2.5-ton bollard pull. In addition to their towing potential; the boats have well equipped medical facilities, updated navigational equipment and portable pumps. In order to maintain the high standards for which the DGzRS (German Maritime Search and Rescue Service) is known, these vessels are replacing slightly smaller and less powerful craft. They will join a fleet of 40 SAR boats and 20 larger SAR cruisers. This new series of aluminum boats is being built at the Tamsen Maritim yard near the Baltic Sea in northeastern Germany. Delivery of one of the boats was in June of 2018 with six others to follow from the Tamsen yard and three from another German yard.